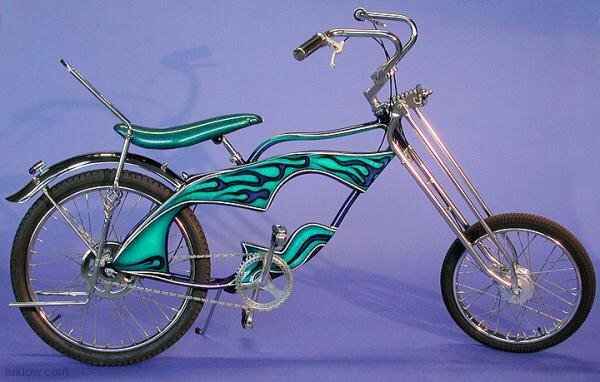 The 1999 Lux Low Cool Hot Blue Chopper Bicycle is an Ultra Modified Chopper Bicycle that turns heads. 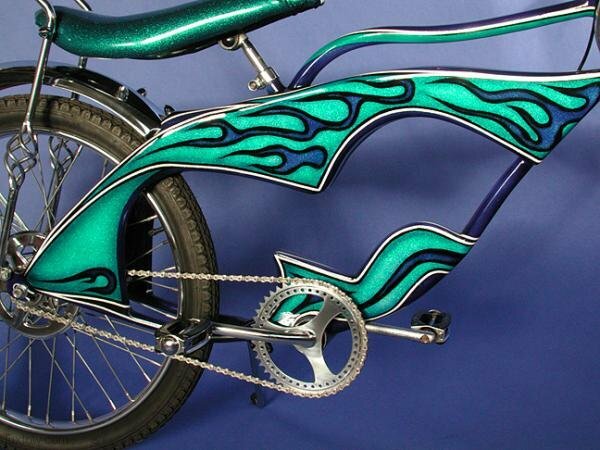 Built on an Original Schwinn frame, the Cool Hot Blue is Stretched and Raked, with Sheet Metal added, topped with Fiberglass, Shaped and Sanded Smooth. A base of Abalone Holographic Flake covered by Many Colors and Masking Designs (approximately 19 different layers) formulates Cool Hot Blue’s Unique Design and Artistry. 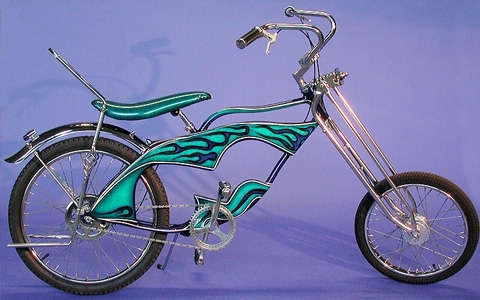 Cool Hot Blue’s Fork is a Luxury Lowrider Original, Super Heavy Duty Chrome Chopper Springer Fork. The Crank Set is Drop Forged from High Carbon Steel, Chrome Plated with Alloy Sprockets. The Rear Wheel is Heavy Duty Sturmey Archer Drum Brake with High Tech Alloy Brake Lever, Chrome HD Rims , and 11 Gauge HD Spokes. 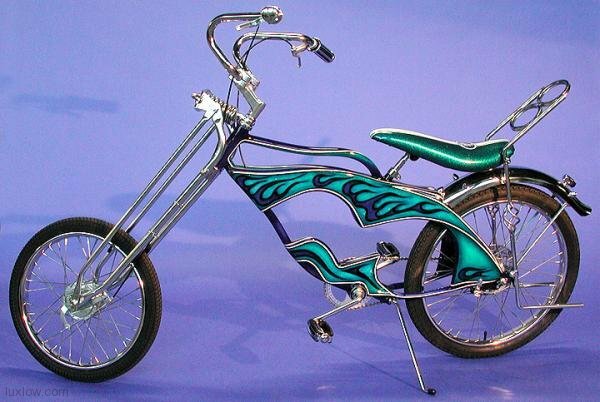 The Rear Fender is a modified Chrome Phantom Fender with Chrome Studs. The Front Wheel is a Heavy Duty Lei Leu Drum Brake with High Tech Alloy Brake Lever , Chrome HD Rims , and 11 Gauge HD Spokes. The Handlebar Stem is a Vintage ACS BMX Stem. 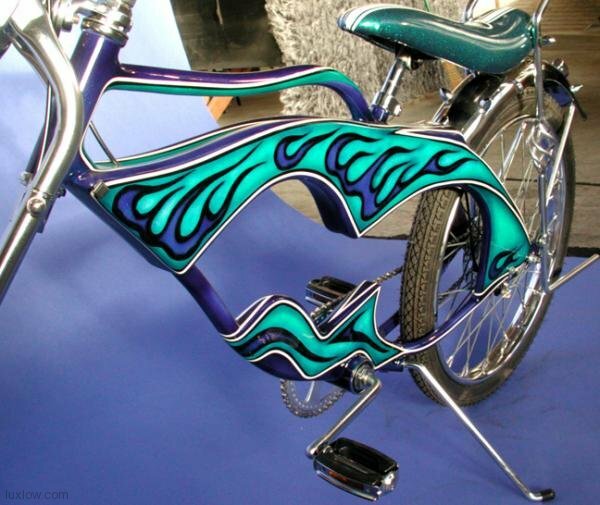 The Handlebar is Chrome Plated, Wald TriangllaFunk Bars with Chrome Lowrider Grips. The Seatpost & Clamp are High Quality Chrome Arnold Schwinn Seatpost clamp and Chrome Script seatpost. The Seat & Sissy are Super Cush Lux Low Cascade Seat With Stripe and Deluxe Lux Low Custom Sissy Bar. The Kickstand is a Chrome Kickstand with Dust andRattle-Proof Construction. With so many Details involved in Cool Hot Blue’s Design and Construction, it’s no wonder that Heads Roll when he rides by.